Mouth ulcers are painful sores in the oral mucous membrane. They usually have an oval or round shape and a diameter of three to four millimetres. · A mouth ulcer is grey, white or yellow in colour with a red inflamed edge. · They appear on the inside of the cheek, lips, gums or under the tongue. · Mouth ulcers can occur singly or in groups and usually disappear within one or two weeks. 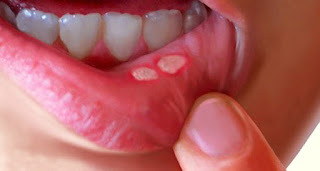 · Mouth ulcer slowly recedes and will disappear within 10-14 days. · Pain slightly decreases as the mouth ulcer(s) gets smaller. If the mouth ulcer doesn't disappear after two weeks, you should visit your doctor or dentist, because this can be a sign of an impending disease. About 20% of the population suffers from chronic mouth ulcer, called recurrent oral ulceration or recurrent aphthousstomatisis. This disorder is characterized by recurring ulcers every week or month. · If a sore begins soon after you start a new medicine. · If you notice large white patches on the roof of your mouth or your tongue (this may be thrush or another type of infection). · If the mouth sore lasts longer than 2 weeks. · If You have a weakened immune system (for example, from HIV or cancer). · If You have other symptoms like fever, skin rash, drooling, or difficulty swallowing. If any of this above mentioned signs and symptoms occurs kindly walk into any of our nearby PS Dental centre for the specialist consultations ,proper guidance and treatment at the right time. Should I have to worry about ulcers? Most ulcers heal up on their own. However, if they don't heal within three weeks you should visit your dentist. Our dental team will be able to examine your mouth to check that the problem is an ulcer and not something more serious such as mouth cancer. If you suffer from ulcers that come and go often, you should visit your dental team to check that there is not an underlying medical cause.